The request for more Shelters that allow pets, is a very big issue in the homeless community. Many homeless have dogs as companions that need to be housed as well as the homeless. This leads to many homeless staying on the streets because they cannot find housing due to their pets not being allowed to stay in the shelters. In speaking with shelter representatives I have found that the top issue is liability and the extra costs for insurance. 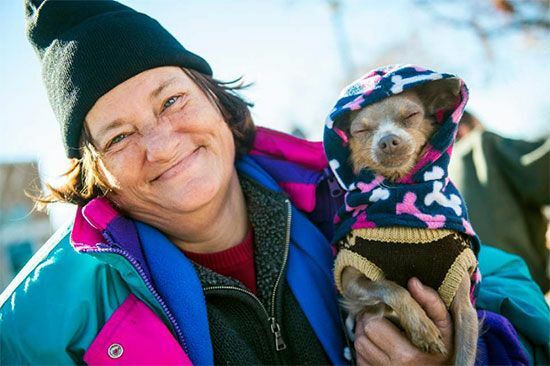 Shelters operate on thin budgets and for the most part, rely on donations to stay open. The shelters do not have budgets to either the liability insurance of finances to handle possible lawsuits from pet involved issues, such as dog bites. We contacted insurance broker, Markus Lovato, who advised us that pets "significantly increases shelter liability". "Homeless shelters are normally on the border of remaining open due to the lack of the influx of funds. They really do not have the funding to purchase pet liability insurance coverage which can double their liability costs." 1. Allergic reactions to pet dander to the guests. 2. The fear of dogs/pets. 3. Many shelters are in city locations so pet waste is always a big issue. This is an environmental health issue. Even with all of the issues as stated above, there are still a number of shelters that do accept pets. Use our pet friendly search to located a pet friendly shelter in your city.